Why I read this book: Four sisters who were queens in the middle ages? Sign me up! The time is the 1200s. Crusades are happening galore to fight for the holy land. Countries are still forming their boundaries leading to additional fighting. Even more fighting comes from the fights inside their borders. Four daughters are born to the Count of Provence (which is kind of in south east Europe). Their mother raises them as she would sons and has the highest expectations for her daughters, namely to make them queens. There is Marguerite who would be Queen of France, Eleonore who would be Queen of England, Sanchia who would be Queen of Germany and Beatrice who would be queen of Italy. The story is about how they get there, sure, but mostly it is about the interactions between the siblings throughout their lives. I highly enjoyed this story. It is a tale of a time that I cannot really fathom living in. All that war, all that oppression. At the same time, though women were pretty darn oppressed at this point, I don't believe they hit the peak, so it is interesting to see how they weave their way to take control when being born a women means they could not. The plot focuses on the sisters and their lives. It starts when Marguerite is about to get married off to the future King of France. The point of view bounces between each of the sisters at different point through the story, but is all told in a linear fashion. Instead of directly focusing on one of the many issues of the time, Jones allows us to view these problems through the eyes of her queens. I highly enjoyed this book, but there were some times where I felt that it dragged a bit. I don't know if this was due to the fact that I read huge chunks of it in one sitting (on an airplane), but I did have to stop and pick up another book because it was just too much at times. But despite that I really liked it and would recommend it to anyone who likes historical fiction. Especially with strong women! Ooh, I happen to LOVE historical fiction. 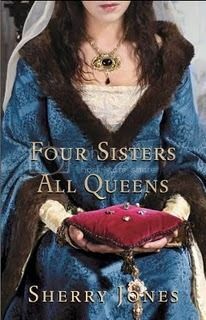 And this sounds utterly intriguing - four sisters groomed to be queens? Sign me up! This looks like it's right up my alley! I love the family dynamic and I can't wait to get this from the library. Would you say it's melodramatic at all? Thank you for reviewing FOUR SISTERS, ALL QUEENS. I am so glad you enjoyed it! I'm curious -- which of the sister queens was your favorite? You're welcome. You know, I have no idea. There were things I liked and disliked about each one. I really just enjoyed the dynamic between the four... and I'm glad I didn't have to make the choices their characters did. I think I'm going to have to read this book. Historical fiction in a time period I'm not tired of yet! I know! I love finding books that fit into a point in the history of the world I have not been beaten over the head with. I think I will probably end up reading this book because I LOVE historical fiction!